Every special occasion needs a special cake, right? I made this cake for a friend of mine this weekend. Her son was being baptized into The Church of Jesus Christ of Latter-Day Saints. Click here if you want to know more about what we believe. I love making specialty cakes like this one. They’re small and it’s fun to get creative. If you’re new here, you might want to check out my tips for baking cakes here. Or my fondant recipe here. Once you figure out how to make your own fondant, the sky is the limit! Fondant is just like playing with play dough. In fact, I’ve used a play dough mold for fondant before, and it worked like a charm! I made this Book of Mormon by starting with rice krispies. I covered a sheet of rice krispies with a thin layer of frosting, and then topped it with fondant. I printed off an Angel Moroni on cardstock, cut it out with scissors and then placed it on top of my yellow fondant. Then I used a razor blade to carefully trace and cut out the design. Fondant sticks together with a small amount of water and a paint brush. We used the same technique for the Choose the Right symbol. Just print off any design you want, cut it out and trace it with a razor blade. I have a Cake Cricut, but sometimes it’s just easier to do it by hand. I got one of my sons ties out of the closet and just looked at it for reference while I was making this tie out of fondant. Super easy. 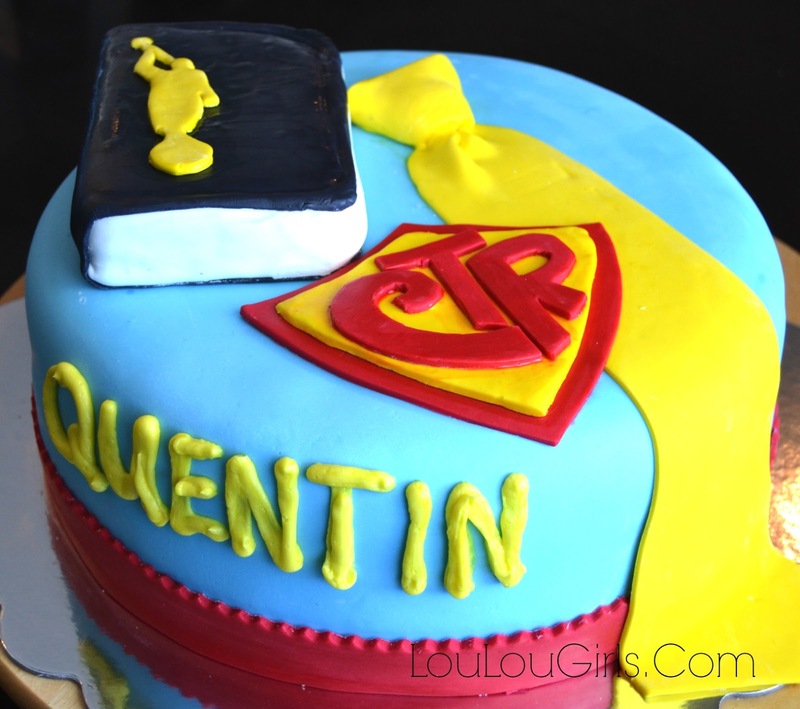 I simply piped Quentin’s name on the side of the cake with buttercream frosting. The border was cut out with one of my fondant tools. It’s like a rolling pin with removable parts. I love it for borders on cakes. I used to try to do it by hand with a ruler and I always messed it up. Sometimes it pays to just buy the tools.